A desmodromic variable valve opening/timing concept I designed. Variable valve timing devices, whether for adjusting lift, duration or opening and closing timing are widespread among valvetrain systems using valve springs. 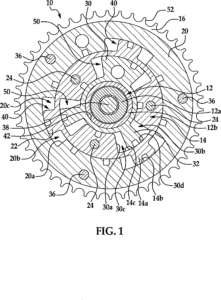 But not a single system has ever found it’s way into desmodromic valvetrain’s, except for the Ducati Testastretta engine that uses common cam phasers to vary the opening moment of the valves. Although this helps to improve the engine’s performance, idle quality and fuel efficiency, it’s still not as flexible as the sort of variable systems in use on many car engines. There’s a clear reason as to why complicated desmodromic variable devices don’t exist; the market for desmodromic devices limits itself to Ducati motorcycle engines. Since the emission standards for motorcycles are substantially lower than those for cars Ducati would have no reason to install complicated and costly devices on their engine unless required. Following up working on my other desmodromic valve concept, I designed this unique desmodromic variable valve timing setup. The design is based around the desmodromic concept I built before. Each rocker arm operates 2 valves, so that the number of cam lobes is just 4 per cylinder. The closing arm rests on a ball stud that self adjusts with oil pressure. The opening rockers hinge on a shaft and cannot self adjust, adjustment can be performed during maintenance intervals. 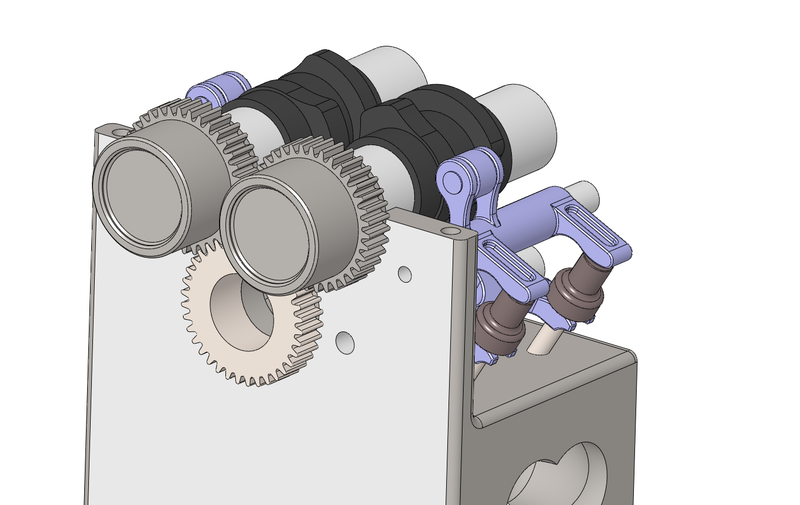 The camshaft makes the difference and is a so called ‘split cam’ design. This design had been patented first in the 1920’s and uses 2 cams that sit concentrically in each other. In this design, the outer camshaft holds one half of each lobe, while the inner part of the camshaft holds the other half of the lobe. In order to fit the 2 shafts and lobes inside of each other, the lobes are pinned to either the inner or outer shaft. 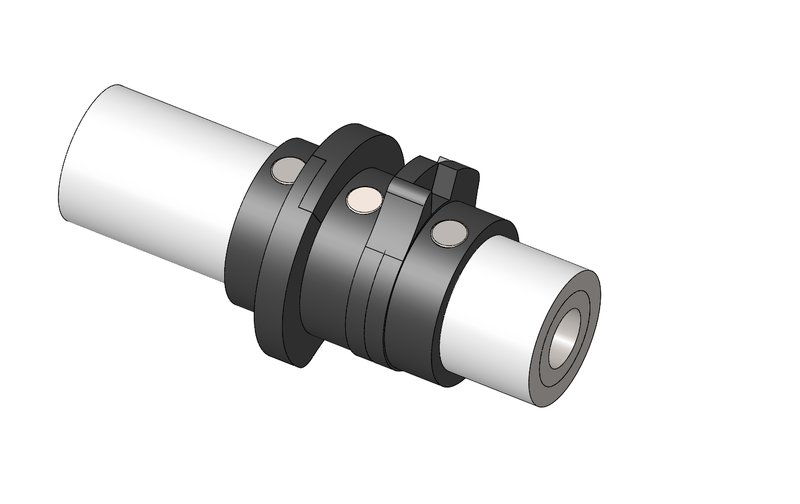 The outer shaft has additional slots milled to allow the pins for the inner mounted lobes to fit. 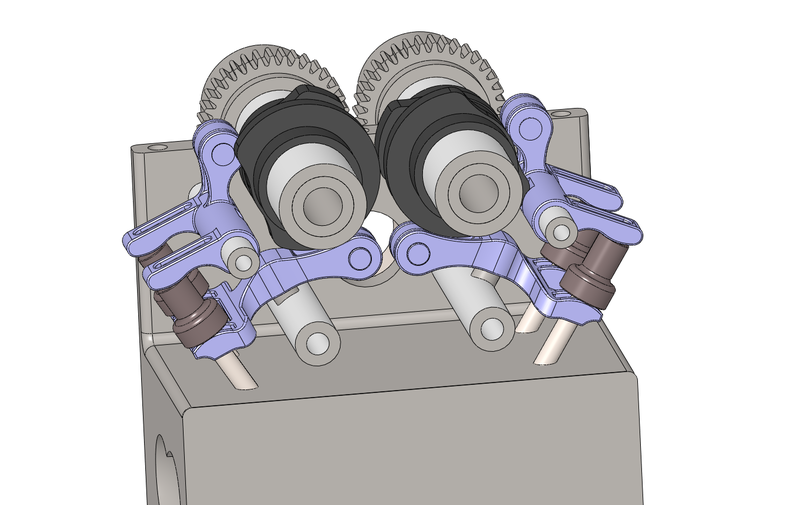 By adding a camshaft timing phaser at the front the 2 halves of the lobes are moved closer to each other for less duration or further apart for more duration. 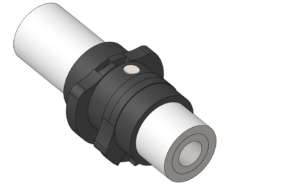 In this design, the variation in degrees is done at maximum valve lift. However, this amount is limited by the opening and closing ramp angles, which in this design is as steep as a Ducati Monster 900 engine. Due to the unique design, for each degree of variation, a mandatory degree is fixed at maximum valve lift. So in order to reach 10° of variation, at least 10° of lift @ maximum lift needs to be accounted for. The lobe design as shown below allows for a variation in duration of 205° – 260° at maximum valve lift of 6mm. 6mm might not seem much, but this design does not focus on large capacity engines. I suggest up to 450cc per cylinder would be the maximum with this amount of lift. Also, the wide duration range would outweigh a conventional fixed cam profile by far even if it has more lift. If more lift is required though, the variable duration could be shortened, or the ramp angles made steeper. The lobes themselves need to be milled prior to fitting to the shafts. However, it is likely that the lobes will require grinding for a final finish. 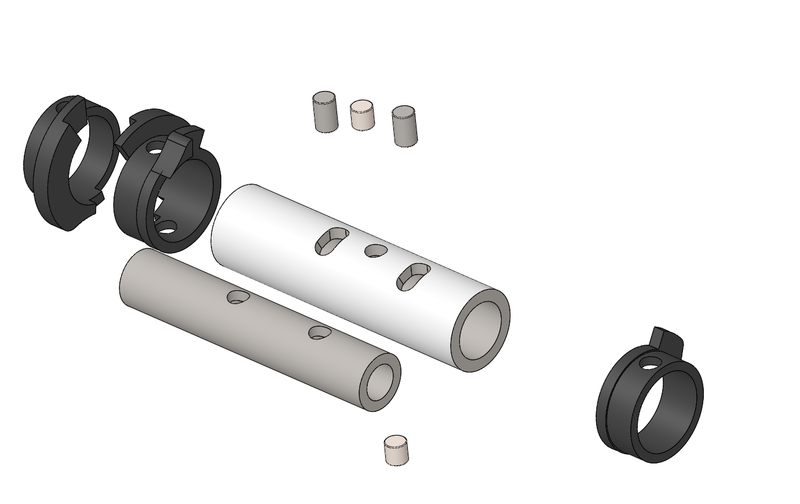 For an even finish, the complete 2 piece lobe will need to machined as fitted to the shafts. In order to avoid chatter, it would be best to apply oil pressure to the 2 concentric shafts, also to avoid dirt entering the shaft. In addition, as can be seen in the screenshots below, both the opening and closing lobes have concave sections. These are required as this design uses roller bearings on the arms. Concave milling is easy, but grinding would require a wheel with a very small radius. Although this is not impossible (I’ve seen several concave camshafts), it adds up to the manufacturing costs. This design is not intended for a high performance engine, but by increasing the duration more lift can be used as well should it be used on a higher rpm engine. This design focuses on driveability and reducing fuel consumption. In theory, the desmodromic system itself reduces some frictional losses but most of the gain comes from the wide range of duration. When idling, the full 260° can be used to make use of the Atkinson cycle, in which the engine pushes out much of the air it just took in. Additionally resulting in a smooth idle. The Atkinson cycle can also be applied to other parts of the rpm range. When accelerating the duration of 205° can be used from idle on and gradually increase to 260°, such that the duration both advances on opening and retards when closing. Like with conventional cam phaser systems, the EGR function can also be included by using much overlap on demand.